Summary: What really goes on behind those perfect white picket fences? Don't let the cover fool you! If you're anything like me and see shoes and legs on the cover of a novel, you immediately consider the book "chick lit" (not that there's anything wrong with that!) 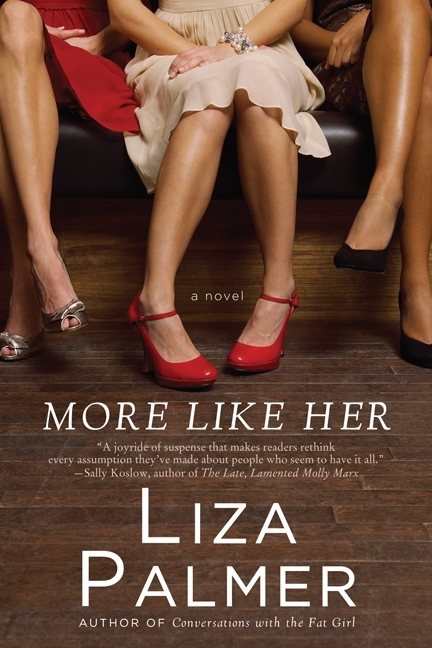 For whatever reason, I didn't read the description on the back of MORE LIKE HER by Liza Palmer which would have given me some pretty strong clues that this book wasn't a light and fluffy read. However, when I opened up this book and read the prologue which describes a 911 call about a school shooting, I knew for sure that this book was going to deal with some very serious issues. And I shouldn't have been surprised because I've read a few of Ms. Palmer's novels and they are always a wonderful mix of humor and pain. MORE LIKE HER is a powerful story about three best friends who work together at a school. Each woman is facing her own set of issues, yet when they encounter the brutal murder of a woman who seemed to "have it all," they suddenly gain some valuable insight into their own lives and how they perceive others. The narrator of the story is Frannie and I found her to be a complex character, yet overall very likable. When the novel begins, she is still reeling from a break-up of her two year boyfriend (who also works at the same school); and she does have some major baggage when it comes to relationships. At times, I found her to kind of annoying, but she was so real. (In fact, I had a friend who was so much like Frannie that I could barely believe it.) I loved rooting for Frannie to find a good guy, and I enjoyed seeing her eventually accept and even appreciate herself. By the end of the book, I felt that Frannie grew so much as a woman and a friend; and I found her story to be heartwarming. And then the floor fell out from under me. I was quickly reminded of the serious nature of the prologue and suddenly the entire story took on a much darker tone. Prior to this incident, the book was almost light and definitely funny; and while it did deal with some small issues that each of these women had, their problems seemed relatively normal. However, after the shooting, I felt as if the book took on a much deeper meaning. Yes, we all have problems and they might seem to be huge to us, but we need to keep a better perspective on things. In addition, this book served as a reminder that even those of us who seem to have the perfect life have problems... and sometimes they are extremely serious. One thing I can say for sure about Liza Palmer's books is that they are very real to me. The women in this story were smart and attractive and still felt insecure about certain aspects of their lives. Despite being quite a bit older than them, they seemed very real to me and I could relate to them. Her novel are both funny and sad -- just like real life; and they cause me to think about my own situation. I think that says a lot about her skills as a writer. MORE LIKE HER would make an interesting discussion for female book clubs. I wasn't able to find a reading guide at this time, but I'm pretty sure that there will be on available in the very near future. Don't let the lack of questions deter you from choosing this novel though. There are so many issues to discuss including love, relationships, friendships, breakups, career choices, self acceptance, first impressions, secrets, and many more. I am pretty sure that women of all ages will be able to relate to this story and find many things to talk about. I thought MORE LIKE HER was an excellent story and it certainly made me rethink my life and caused me to have a better perspective on things. Highly recommended. Ok, you had me with the floor fell out from under you. Must put this on the TBR list. This sounds like a very powerful book. From the description I'm guessing what happened and it sounds gut wrenching. I wonder why they chose the cover they did? Sounds like a great book! I just found your blog and have to say I have been thoroughly enjoying it. I'm glad I read your review (which is terrific by the way) because never in a million years would I have considered this book simply due to the cover. This sounds great. Thanks for the review - I'd never heard of this one! Consider it added to my list! I like books where characters grow and change. From your great review, I can see that the cover doesn't quite suit the book. Our book club has never done one of those books that cause you to discuss relationships and all. I think it could be fun! i just finish reading this book last night and i couldn't agree with you more! i walked into this book thinking it would be a nice fluffy book to read to to break up all the depressing books i've been reading lately, but boy oh boy was i in for a surprise! And there really are great women's literature that aren't sappy or goofy or predictable out there! I instantly think of Marisa de los Santos as an example. But the cover would throw me. I wonder why publishers do that? I stalled out half way though this book, but maybe I'll pick it up again, I don't know something about the pacing felt strange to me. From the cover I would have never guessed that the novel would have intense or serious elements. Sounds really interesting, the cover is quite misleading - thanks for the heads up!